When George Mallory and Sandy Irvine attempted to reach the summit of Everest in 1924 they came closer than any previous attempt. Captain John Noel filmed in the harshest of conditions to capture the drama of this fateful expedition. Now restored by the BFI National Archive, The Epic of Everest opened in cinemas to great critical acclaim and is released by the BFI in a Dual Format Edition in January. Inspired by Herbert Ponting (The Great White Silence), Captain Noel recorded images of breathtaking beauty and considerable historic significance using specially adapted equipment. The film is also amongst the earliest filmed records of life in Tibet. But it is the brooding presence of the mountain itself that is the heart of Noel’s film, and his photography captures the magical play of light and shadow on an alien landscape which enhances the vulnerability, isolation and courage of the mountaineers. The restoration – undertaken in collaboration with Sandra Noel, the director’s daughter – has transformed the quality of the surviving elements of the film and reintroduced the original coloured tints and tones. The BFI commissioned a new score by Simon Fisher Turner which was released on LP/CD by Mute in October and has been voted No.1 soundtrack of the year by Mojo magazine. Also included on the release are three documentary featurettes about the film, the restoration and the score, and an optional alternative musical accompaniment; the original 1924 score as recreated by Julie Brown, a specialist on film music and early twentieth-century concert music. 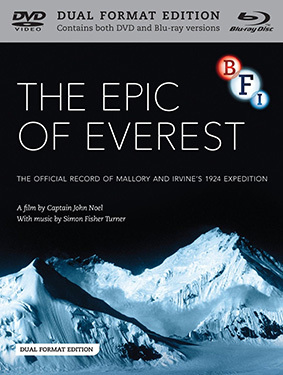 The Epic of Everest will be released on UK dual format (DVD and Blu-ray) on 27 January 2014 by the BFI at the RRP of £19.99. 30 page illustrated booklet with essays/contributions from explorer and writer Wade Davis, Simon Fisher Turner, Sandra Noel, Julie Brown and the BFI National Archive’s Kieron Webb, plus notes on the musical extras and full credits.